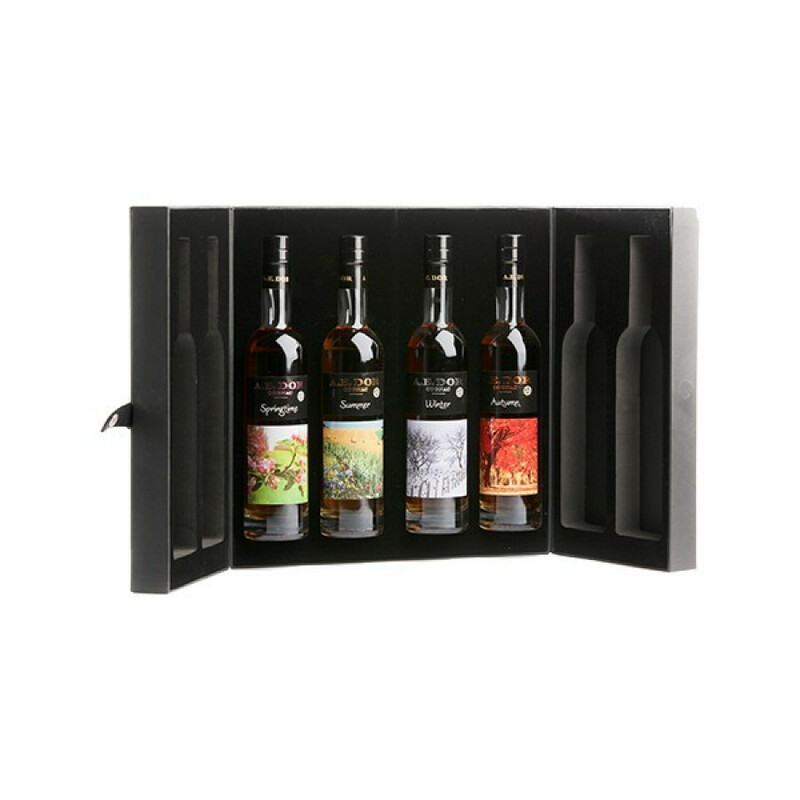 The AE Dor Tasting Set - Seasons - is an elegant and luxurious box containing a variety of cognacs that represent the four seasons of Spring, Summer, Autumn, and Winter. Each bottle is 20cl in size and the set is presented in an elegant black gift box. Printemps: (Spring) A young, vibrant cognac that's uniquely floral, with notes of lilac and almonds. The finish brings with it delicious notes of violets. Ete: (Summer) A young, expressive Cognac that shines with an unexpected depth of quality. Fruity, fresh, and floral with aromas of apricot, peach, plum, and orange. Automne: (Autumn) A Cognac that's been aged for 4-5 years, proving delightfully warm, with notes of cinnamon, vanilla, ginger, and caramel. Hiver: (Winter) Golden in color, aged for 4-5 years, it's well named, offering the taster spicey aromas of coffee, grilled hazelnuts, and pepper. This superb tasting set is ideal for those who want to discover Cognacs from a house that's been pouring its expertise into the creation of top quality cognacs for centuries. Or if you're looking for the perfect gift for a Cognac lover, this set would make an excellent choice.